Pre-orders for your upcoming releases seem to be all the rage right now. Will the trend continue and be a viable option in weeks and months and years to come? Or will they go the way of the Dodo bird, video rental and beeper stores? We don’t have the answer to any of that hot mess but co-hosts Armand Rosamilia and Chuck Buda tell their own personal feelings about doing a pre-order on your book. 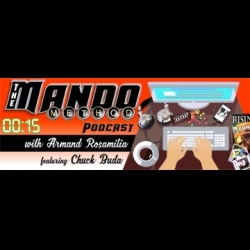 The Mando Method Podcast tackles all issues, big and small and sized between those two choices. Then, and only then, Erin Sweet Al-Mehairi answers more of the listener’s questions about marketing and more on her Marketing Morsels segment of the podcast. Followed by Chuck’s world famous fish stick sandwich recipe, which he makes while wearing his favorite pair of yoga pants. Luckily this is an audio only show.